On a sunny July afternoon, sailors take part in a disabled sailing race in the Toronto harbour. The fleet of boats are designed for accessibility, with sails controlled from the cockpit, a joystick tiller and lines within easy reach. Under the heat of a setting sun, the skipper eyed a marker floating in Toronto’s harbour and judged whether his small sailboat could get past on its current course. Too tight, he decided, so he did a quick turn, exchanging the vista of the city’s burgeoning skyline for the bucolic green of its harbour islands. Moments later he turned again, squeaked past the marker and started running with the wind on the last leg of the race. 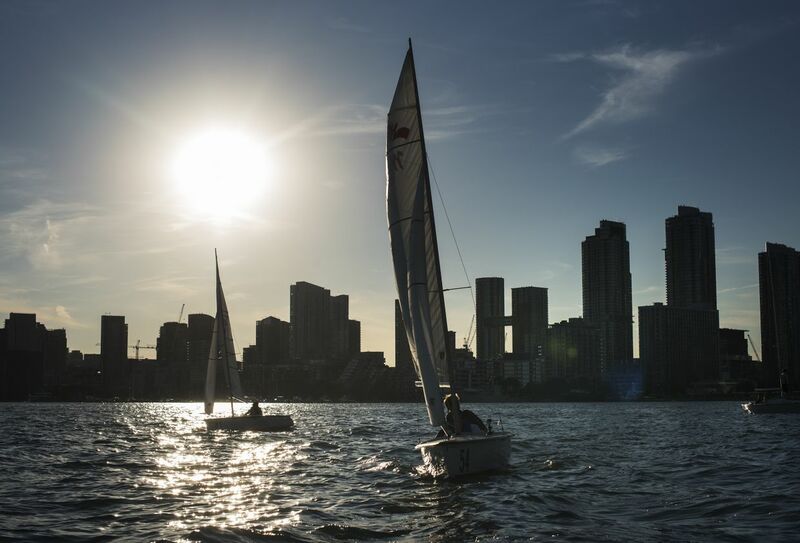 From a distance, it would have seemed a typical scene in Toronto’s inner harbour, where scores of sailboats dot the water on nice weekday summer evenings. Looking closely at the boats in this race, though, exposes some key differences. In these, the skipper sits low in the hull, steering with a joystick. The ropes are laid out so the five-metre boat can be handled by that one person, who need not change position. And at the dock from which the boats launched, a gaggle of wheelchairs waits for the skippers to return. 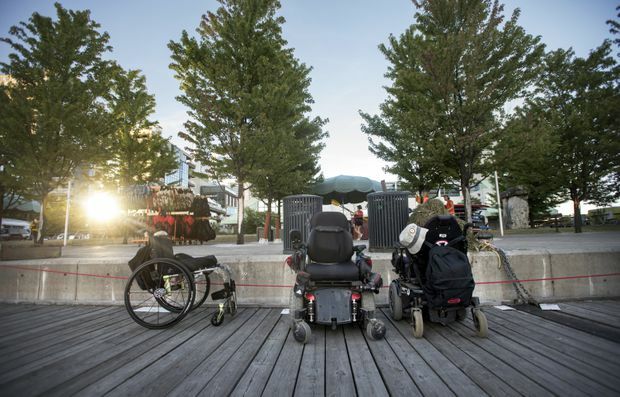 Wheelchairs sit on the dock near Queens Quay during the July 18 race. On Toronto’s steamy nights, there’s something addictive about escaping onto the lake, with wind in the hair and water in the face. But sailing can be an exclusive activity. It tends to be pricey and typically requires agility, strength and the full use of all limbs. So for nearly two decades, a donation-funded group in the city’s downtown has been working to make the activity accessible, with a low cost of membership and boats built around the needs of disabled sailors. Having left their wheelchairs behind, these members can enjoy the same sensation as anyone as they bounce through the waves. The group’s small fleet books up fast, and when the sailors come back off the water their sense of thrill is palpable. 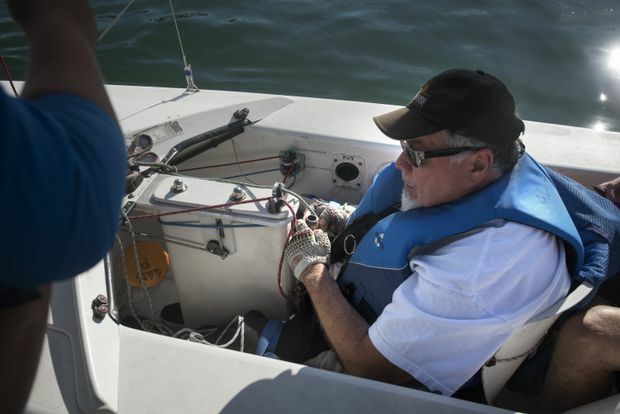 “When I am sailing on my own I feel like it’s just me against the elements,” said Al Harris, 56, who has been paralyzed since the age of 18 and has sailed with the club on and off nearly since its inception. Two volunteers help lower Al Harris into the cockpit of a Martin 16 sailboat. Mr. Harris, 56, has been paralyzed since he broke his back falling out of a tree as a teenager. 'When I am sailing on my own I feel like it’s just me against the elements,' he says. The Disabled Sailing Association of Ontario was founded in 1999 by Danny McCoy, an avid sailor who was paralyzed in a vehicle collision. It now has more than 100 active members, including people who have sailed most of their life and others who hadn’t sat in a boat prior to becoming disabled. “I competed in the 2008 Olympics and in a lot of our competitions we were on the same course as the people who were training for the Paralympics,” said DSAO director Martha Henderson. 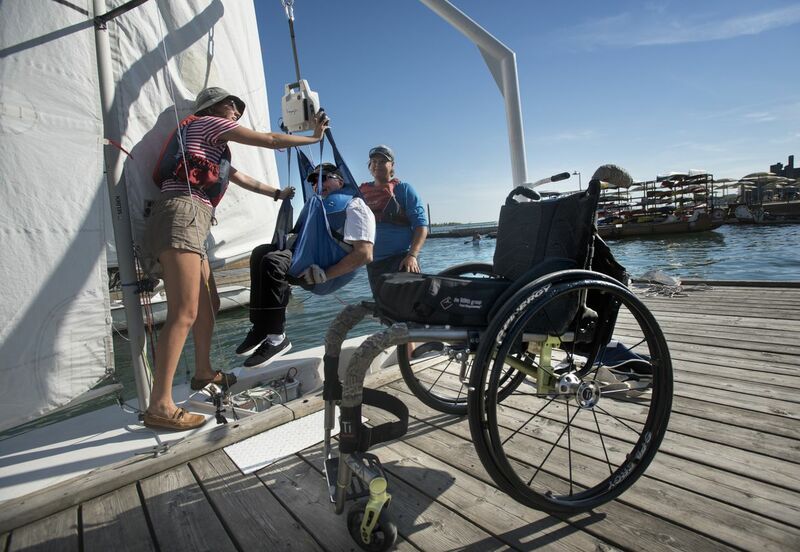 The group’s modest member cost – $50 a year to join and $15 a sail – is not nearly enough to cover its roughly $80,000 annual budget, much of which goes toward hiring staff who can teach sailing and manage the transfer of sailors between wheelchair and boat. The DSAO gets some assistance from government but is largely funded, as a registered charity, through private and corporate donations. Volunteers contribute a lot of the labour. Marcel Deurvorst has been volunteering for 16 years with the group. Most of that has been as a companion sailor, perched in a seat immediately behind the skipper and assisting as necessary. On a recent evening, Mr. Deurvorst was out with Charlie Pen. The 79-year-old had never sailed before joining the club last year and is clearly delighted to be learning something new at this stage in life. And the activity helps distract him from the discomfort of a spinal-cord injury. Mr. 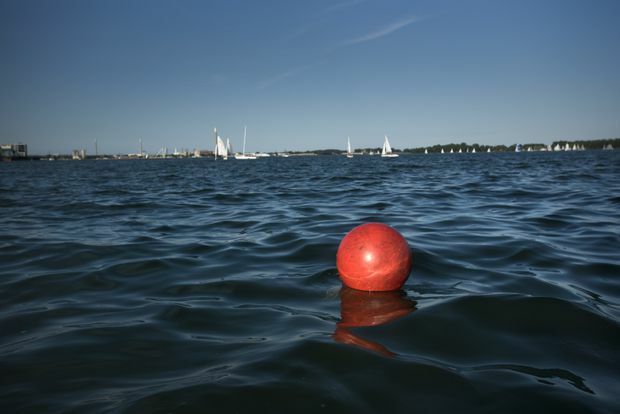 Pen had been out for a non-competitive sail and came ashore shortly before the popular Thursday night regatta. That evening, Mr. Harris was one of five skippers going head to head in a trio of races, each of them involving two laps of a pair of floating markers. Sailing can be an exclusive activity: It tends to be pricey and typically requires agility, strength and the full use of all limbs. Jody Schloss, left, and companion sailor Vicky Choy share laughs after returning from the race. The Martin 16 they were sailing is a boat designed for safety, not high performance. The manufacturer boasts that the boats, built with a heavy weight on the keel and lots of flotation, are “impossible to capsize” and “unsinkable, even if totally flooded.” But they can move nimbly enough to get a sensation of speed. It helps that the skipper sits so low, which, like a GoKart, makes it seem faster. In this race were members with a range of abilities. One skipper could steer the boat but needed a companion sailor to manage the ropes. Another’s boat was fitted with an electronic device to help pull in and release that sailor’s ropes. Mr. Harris, who trained under the certification program White Sail, now called CANSail, managed his own boat. The person sitting behind him had nothing to do but lean to one side or the other, trying to eke a bit more speed out of each tack. Their boat was #54, which Mr. Harris said had been lucky for him in the past. That luck was missing in action this time, though, with two middling results and one stolen victory, secured after another skipper got overconfident and tried to do a swaggering extra loop before crossing the line. The race results left Mr. Harris undaunted. There was cold beer waiting on shore and the sailors were competing only for bragging rights. Plus, he’d already won a few times earlier in the summer. And this was about more than just victory.